I have had a Links Of London bracelet for a good couple of years now and even though i don't wear it half as much as i used to, or should i do still love it and it holds a lot of memories and sentimental value for me. I much prefer gold jewellery and because my bracelet is silver it doesn't really get the love it deserves. 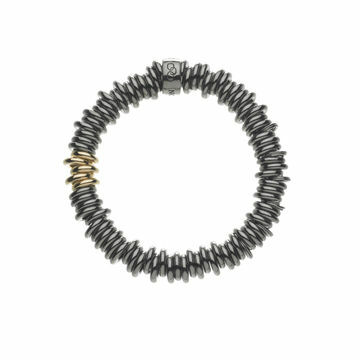 I came across this gorgeous bracelet on the Wharton Goldsmith website that i really do think i need in my life! Its the Links Of London Sweetie Bracelet in Black Rhodium with 18ct rolled gold. I absolutely love black and gold together because i think they complement each other beautifully and the gold really does finish it off perfectly. I would definitely get a lot of wear out of this bracelet and feel like it needs to be mine! The only downfall is the huge price tag of £265, wowsers although they do offer free delivery so that is a bonus! I am also a fan of Pandora and Trollbeads and they have some beautiful charms on their website! What do you think of Links of London bracelets? Or what are your thoughts on charm bracelets in general?